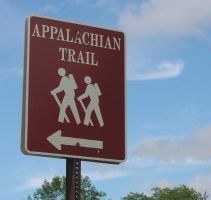 This article is being written for a friend who is soon to be making a journey along that great North-South highway known as the Appalachian Trail. The reason I am not going to spend a great deal of time telling you of how to outfit yourself, what shoes to wear or the essential elements of hiking and camping, as you should already be proficient in such areas if you are taking on such an adventure. What I am going to explore are some elements that the novice hiker may not think about and give you a better understanding of what lies in store for those who are ready to get up and go. First what the AT or Appalachian Trail is before you decide to tackle it. It is roughly a 2000 thousand-mile trail following the crest of the Appalachian Mountains (this means that its not just long, but high as well) from Springer Mountain in the state of Georgia and terminating at Mt Katahdin in Maine. Those who have made hiking trips of more than a few days understand that it is not all a bed of roses, for all the talk of beautiful sunsets and sunrises, the waterfalls, spectacular views and great experiences along the trail, there are the also the tales aching knees that no aspirin can cure, the insects that make you want to jump off a cliff and the mornings that you just can’t seem to get out of your sleeping bag. I remember a trek in the Himalayas on the route to Everest base camp, I wouldn’t have traded it for anything, but along the way, at times I just wanted to survive it. For everything that is worthwhile, it seems you always have to take the good with the bad. I’ve read somewhere that the vast majority of those who being a thru hike finish it. This is not a camping trip, it is a hiking adventure. For those merely taking a week out their busy schedules to hike a portion of the Appalachian Trail, it’s still hard! Its not like you can check into a motel 8 if the weather turns bad, be prepared, always be prepared. 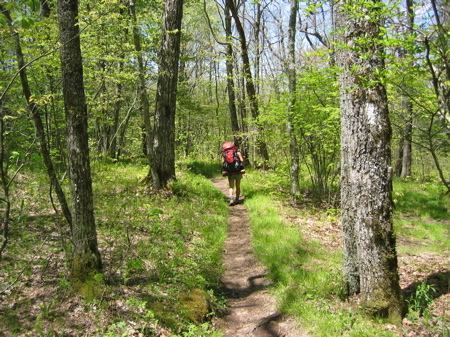 When preparing for your Appalachian Trail adventure, don’t go into it without training. Spend a few weeks walking on relatively flat ground with a light pack to get the feel of it. Adjust the straps and other components to give you the most comfortable positions. As you get closer to your hike add some weight to the pack and find some hilly areas to walk. By the time you are ready to go you should feel comfortable with a full pack and able to walk uphill relatively easily. If you are not prepared and push too hard early in the hike you may develop overly sore muscles and blisters, which can make the adventure feel like a trip through purgatory. Start your trip easy to ensure that you have enough left in the tank to finish. As you get more acclimated to the trail and you own abilities, you can gradually increase the pace, but here is a good piece of information, if at all possible, hike with other that are of your own level. No one wants to fall too far behind or have to slow down too much to wait for others. It’s always a great idea to set goals for the day and adjust these goals depending on conditions, such as weather, injuries or the all too frequent, unexpected incident. Realize that you may have to hike through inclement weather and sore muscles. The Appalachian Trail is a spectacular hike, not only will you get the chance to see magnificent scenery but an abundance of wildlife as well. It’s a smart idea to become familiar with the flora and fauna of the area you will be covering and what types of creatures to avoid. If you really want to see some incredible wildlife then you must be on the move at the same time they are, most commonly early in the morning and first light. Yes, there is a chance that you will see bears, but for the most part, they will leave you alone if you do the same to them. Just don’t startle or surprise them on the trail and don’t leave food open in and around your tent, that’s like a neon deli sign to a bear. Many people carry bear spray, but I feel its just extra weight and fairly unnecessary if you just use common sense, and can run faster than those you are hiking with, Just Kidding!not really). This is a hike that you want to have fun with, don’t be concerned with anyone’s habits but your own. Find a good pace and enjoy it. Before you set out on your journey do some research and find out where the shelters are along the trail in the areas you will be hiking. Although occasionally crowded and musty they can be a great port in a storm. Check by distance and elevation on the Appalachian Trail where these shelters are located to find them. You can also find via the Internet, food re-supply locations, but make sure you know how far off the AT they are. All in all, prepare well and you will have a great Hiking trip! Looks interesting. Have to admit that we have a slug of hikes over here on the West Coast, but hitting the Appalachian Trail might be interesting! But you guys get to go Salmon Fishing! No one should expect any part of the trail to be easy. Georgia, North Carolina and Tennessee are tough. Parts of Virginia are easier and many people make their best mileages in TN, NJ, NY and CT. But even these states have some very hard places. Overall the AT is one of the most difficult hikes in the US. Period. And while you may see wildlife it is not near as common as the writer would have you believe. In the northern states you will see more but the predominate life on the trail in the early months consists of hikers and insects. So carry repellant and be willing to use it. Other than that I say, have fun. Hike your own hike do no allow yourself to be drawm into a sense you have to rush. Do not let others tell you where to stop or what to do use your own judgement. Have fun and enjoy your hike. Listen to your body. and know that like all long distance hikes ot is more mental than physical. For those thru hiking, be careful of your own endurance it is so possible to over do in the early months. For section hikers and everyone plan your supplies and pack carefully. Keep the weight down to 30 lbs if possible. Yeah you may be able to lug more and maybe in the early months need a little more warm gear. Know however that every extra ounce you add is pounding on your knees and ankles the entire time you carry it. Happy Hiking. I enjoyed my time on the trail. It is a life changing experience and not only because of what you will see. It changes your very spirit and being somehow. Great Information! I originally wrote this article for a friend and his brother who will be hiking the AT end of JUly starting from Damascus, VA and spending about a week on the trail. I only disagree about the viewing of Wildlife, although most hikers rarely see wildlife such as Deer, Bear or Turkey, it is not because they are not there, most hikers are not on the move when most of these critters are moving about or are too noisey or upwind of the animals. If you know animal sign and are willling to do what it takes to see them, there are there. BUt then again, this is hiking, not hunting. Hiked 110 miles many years ago from Cherokee NC. north. I was much younger and stronger. It was a very difficult hike. 10-15 miles per day. I would do it again in a minute if my health would allow it. A wonderful adventure and I highly recommend it. Just make sure you are prepared and in shape for it. a truck driver and have often thought of doing a hike from that point, North. How many days would I have to allow to even give it a good try at getting in shape for it. I have back packed about 20 yrs ago in the Black Hills and Glacier. Still can not get it out of my mind. I just turned 67 and weigh 265 lbs.